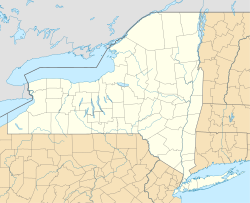 Mastic is a hamlet and census-designated place (CDP) in the southeastern part of the town of Brookhaven in central Suffolk County, New York, United States. The population was 15,481 at the 2010 census. The hamlet was originally called Forge until 1893, when it was changed to the current name of Mastic. The Long Island Rail Road built a station in 1882 and, on July 15, 1960, the stop was moved 7,010 feet (2,140 m) west and renamed Mastic–Shirley. Mastic is served mostly by the William Floyd School District, but also the Eastport-South Manor Central School District north of Grove Drive in the Manor Park section of the hamlet. The Poospatuck Indian Reservation lies entirely within the community, near its southern end and along the Forge River. The northernmost section of the hamlet has been notably called Manor Park, which stretches from Sunrise Highway to Moriches-Middle Island Road immediately east of Brookhaven Airport. Part of the neighborhood lies within the hamlet of Shirley, but is served entirely by Mastic's zip code of 11950. The ZIP Code on the wall of the Post Office. Mastic is located at 40°48′8″N 72°50′38″W﻿ / ﻿40.80222°N 72.84389°W﻿ / 40.80222; -72.84389 (40.802090, -72.843953). According to the United States Census Bureau, the CDP has a total area of 4.0 square miles (10.3 km2), of which 3.9 square miles (10.1 km2) is land and 0.08 square miles (0.2 km2), or 2.13%, is water. As of the census of 2010, there were 15,481 people, 4,526 households, and 3,743 families residing in the CDP. The population density was 3,969.5 per square mile (1,532.8/km²). There were 4,847 housing units at an average density of 1,242.8/sq mi (479.9/km²). The racial makeup of the CDP was 46.1% White, 22.4% African American, 0.7% Native American, 2.1% Asian, 0.1% Pacific Islander, 7.2% some other race, and 4.3% from two or more races. Hispanic or Latino of any race were 21.8% of the population. There were 4,526 households, out of which 48.8% had children under the age of 18 living with them, 57.7% were headed by married couples living together, 18.3% had a female householder with no husband present, and 17.3% were non-families. 12.4% of all households were made up of individuals and 3.3% were someone living alone who was 65 years of age or older. The average household size was 3.41, and the average family size was 3.63. In the CDP, the population was spread out with 28.3% under the age of 18, 10.9% from 18 to 24, 28.4% from 25 to 44, 26.1% from 45 to 64, and 6.3% who were 65 years of age or older, and the median age was 33.1 years. For every 100 females, there were 100.1 males and for every 100 females age 18 and over, there were 97.7 males. From 2007 to 2011, the median annual income for a household in Mastic was $70,979, and the median income for a family was $79,839. Males had a median income of $51,315 versus $40,581 for females. The per capita income for the CDP was $26,176. About 18% of families and 22% of the population were below the poverty line, including 6.6% of those under age 18 and 6.0% of those age 65 or over. ^ a b "Geographic Identifiers: 2010 Demographic Profile Data (G001): Mastic CDP, New York". U.S. Census Bureau, American Factfinder. Retrieved 2013-01-03. ^ a b c "Profile of General Population and Housing Characteristics: 2010 Demographic Profile Data (DP-1): Mastic CDP, New York". U.S. Census Bureau, American Factfinder. Retrieved 2013-01-03. ^ "Selected Economic Characteristics: 2007-2011 American Community Survey 5-Year Estimates (DP03): Mastic CDP, New York". U.S. Census Bureau, American Factfinder. Retrieved 2013-01-03. This page was last edited on 13 May 2018, at 20:46 (UTC).